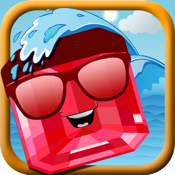 Cali Gems is a match three game that is easy to learn but difficult to master. It is a nonstop blitz of magical gems across the state of California! Reginald Duckling A.K.A. "The Kook Gem" felt excluded from the other gems. He wanted more attention, so he helped his fellow gems escape from Mr. Millers "Gems by the beach" jewelry shop. Now Mr. Miller is chasing down his precious gems scattered all across California! The game is simple. Help the Gem Master line up three or more identical gems vertically or horizontally. Earn tons of tokens along the way and use them to buy fun Powerups. Timed – Match as many gems as you can as the clock winds down. PlusOne – Create any gem to help with your matching blitz. Golden Net – Eliminate all of one type of gem tile in one big blast! Kook Bomb – KABOOOM!! Get rid of the kook gem with this powerful explosive. Pick from the Mavericks, Beach, Big Bear, San Fran, and Hollywood! Match four gems to make one laugh. Match two more tiles with the laughing one, and watch all the adjacent tiles pop! Play to beat your high score, earn tokens, and redeem them for helpful Powerups on your way to match3 glory.